I was listening to All Classical Portland about a week ago [in February of 2018] and heard this string quartet I hadn't heard before and I thought to myself, 'that sounds like Mendelssohn'. I was right, it was Mendelssohn. But I was also wrong as it wasn't Felix Mendelssohn [one of my favorite composers] who I thought, but rather his sister Fanny Mendelssohn. Then I thought to myself, what an amazing classical musical family. 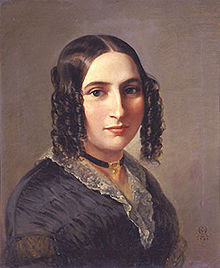 Fanny Mendelssohn [when married became Fanny Hensel] was the oldest of the four children born in Germany, a pianist and like her brother Felix, a composer, who both showed tremendous musical ability at a young age. Please turn up the volume to hear some great classical music compositions from Mendelssohn-not Felix, but Fanny.